Mike Hubbard, Alabama Speaker Of The House, Convicted On 12 Ethics Charges : The Two-Way After the jury found Hubbard guilty of more than half of the 23 charges, he's been stripped of his leadership position, and could face up to 20 years in prison for each felony count. Mike Hubbard looks at family and friends sitting in the courtroom as deputies wait to take Hubbard into custody on Friday, in Opelika, Ala.
Alabama House Speaker Mike Hubbard has been ousted from office and could face up to decades in prison after a jury found him guilty on 12 of the 23 ethics charges. Hubbard was taken into custody after the jury returned its verdict Friday night in Opelika, Ala.
Hubbard was accused of using both his speakership and his position as chair of the Alabama Republican Party for personal financial gain, by allegedly funneling money to his private businesses, Craftmaster Printers and the broadcast company Auburn Network. Prosecutors say Hubbard used the power of his office to improperly benefit his companies and clients and to try to obtain $2.3 million worth of work, investments and financial favors, as MacKenzie Bates of Alabama Public Radio tells our Newscast unit. As NPR's Debbie Elliot pointed out, it's ironic that he's being accused of violating "an ethics law that he championed shortly after he orchestrated the Republican supermajority in the Alabama State House." Hubbard's 12-day trial marks the latest development in the saga of political scandals plaguing Alabama, involving three top elected officials, including Hubbard and current Gov. Robert Bentley. Bentley — who's facing impeachment proceedings for his inappropriate relationship with a top political aide — and former Gov. Bob Riley both testified, as did Hubbard, in his own defense. "We hope this verdict tonight will restore some of the confidence in the people in the state of Alabama that public officials at all levels in the state of Alabama will be held accountable for their actions," acting Attorney Gen. Van Davis said. As Troy Public Radio's Kyle Gassiott reports, the 12 charges include "voting on legislation with a conflict of interest, using his office for personal gain through a consulting contract and lobbying the governor's office for his consulting clients." Gassiott adds that the now former House speaker faces a prison term of up to 20 years for each count. From the start, Hubbard has denied the charges. He and his team of lawyers argue that Hubbard's transactions were legal because they complied with ethical standards in business dealings, and were carried out between longtime friends. The defense say they plan to appeal the convictions. 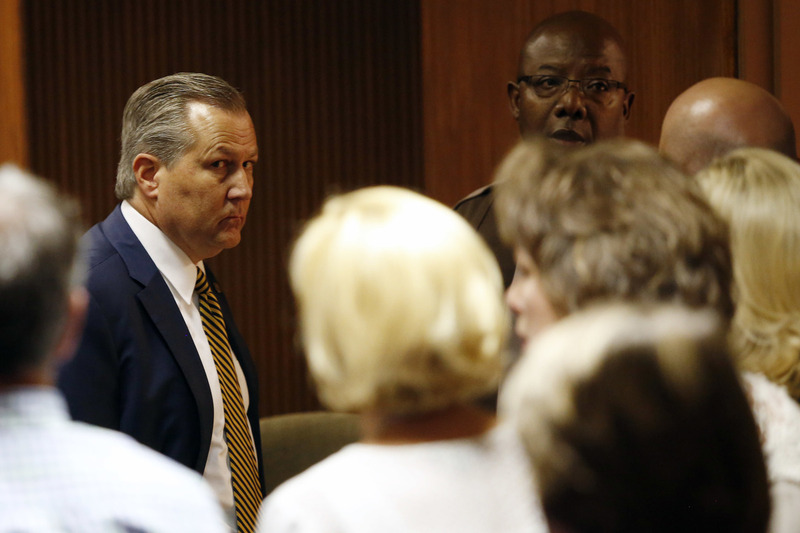 Hubbard's sentencing is set for July 8.